Look how easy it will be for one to find quality information about Schubert, Franz piano music including printable sheet music, free mp3s, and other useful info. It has been said that what Ludwig van Beethoven did with structure, Schubert did with harmony. 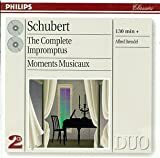 Schubert is unique among the composers in that he could evoke the deepest emotions out of sheer simplicity, and by changing the mood suddenly within a piece. His music is a great test of a pianist’s subtleties and nuances since the music itself is not very technically challenging. Each piece is like a musical journey into humanity that is the very sorrow of love’s revenge and those emotions related to ecstatic joy. The ultimate goal of Romantic music was to attain freedom of design to express powerful human emotions through music. The romantics appreciated the form, and especially did Schubert as he clung on the many Classical notions, but he also broke off the limitations, adding or expanding sections of music that would not normally be allowed. Use this link to search our database of piano music compositions by Schubert, Franz. 2. You can create your own sheet music free of charge using special notation software. For High-Quality sheet music delivered to your home, you can order a copy of piano music by Schubert, Franz from Sheet Music Plus.